For each of the following combinations put the two ingredients in the blender. Once blended, pour into paper cups about half full. Each of the above makes about three serves. 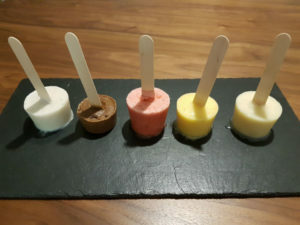 Put a large wooden icy pole stick in the middle and freeze. 1 Cup Coconut Milk with 3/4 Cup Chopped Banana and 3 Tsp Raw Cacao. TIP: When you first put them in the freezer the icy pole stick may not stay straight in the middle. After you have been freezing them for about half an hour, move all the sticks so that they straight in the centre of the cups. I purchased large icy pole sticks from the Riot art and craft shop as this size is a bit sturdier for the ice blocks.